(Photo: Reuters / Majed Jaber)Jordanian Christians attend a mass at the Syriac Orthodox Church in Amman May 21, 2013. Hundreds of Christians gathered to demand the release of the two bishops of Aleppo, Yohanna Ibrahim (Syrian Orthodox) and Paul Yazigi (Greek Orthodox), a month after their abduction. The message for Christians to engage with their Muslim neighbors often seems to come in the West, but this time the call was made in the Middle East. Arab Christians have to engage more fully engaged with their neighbors, especially Muslims around them, a Palestinian bishop who heads the Lutheran World Federation has told a gathering of Middle East church leaders. 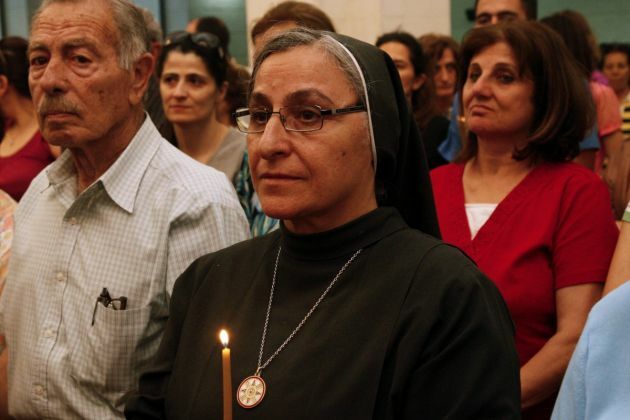 "I say today that we Arab Christians have no choice but to be in conversation with our neighbors," said Bishop Munib A. Younan, president of the 70-million strong Lutheran World Federation in Beirut, Lebanon. "I hesitate to use the word 'dialogue' since that word could imply a detached, academic exercise. Dialogue is important in some contexts, but we need full engagement. "We need engagement with all monotheistic faiths, especially Muslims," said Younan, who heads the Evangelical Lutheran Church in Jordan and the Holy Land. He leads one of the smallest churches in the World Council of Churches and the LWF, but it has a strong presence in the Holy Land, noted among other roles for the key part it plays in education. 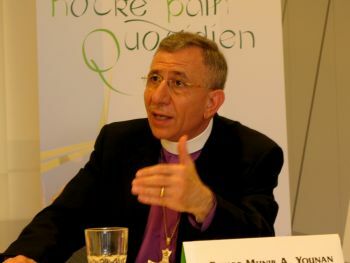 Younan was speaking at a joint World Council of Churches and Middle East Council of Churches conference on the Christian presence in the Middle East, on May 22 in Beirut. The global and regional church leader called on the heads of the churches in the Middle East Council of Churches "to be the living witness of the church." (Photo: Ecumenical News / Peter Kenny)Bishop Munib A. Younan, president of the Lutheran World Federation, speaking in Stuttgart Germany on July 24, 2010. He noted, "Our voice is missing at this time of Arab Awakening. Our silence has given the impression that we are afraid or that we simply accept recent developments. The future of Christianity in our region is found when we show a different way, the way of love to our societies." Younan stressed however, "We are living in a time of uncertainty, when the Middle East is boiling. It is imperative that we have made the effort to gather in this critical time." At the May 21-25 meeting, the general secretary of the World Council of Churches, Rev. Olav Fykse Tveit said, "Christian solidarity means that we care for life, rights and dignity of all human beings, while we work together in hope for a better future." Tveit also discussed Syria, a country of significant concern to churches around the world. He said that the people of Syria have paid an enormous price for the failure of their government in protecting its citizens, the WCC reported. "This is the failure of the international community to provide a political solution to avoid the tragedy in Syria, which also includes the kidnapping of the two Syrian Orthodox bishops from Aleppo," noting the two bishops symbolizing other clergy who have been abducted in the area. "We are here to listen to the concerns of churches in the Middle East and learn from their experiences of living together in plurality with other faiths," the world churches leader said. In his speech, Younan said the process of reform continues to be at the heart of every Arab and Middle Eastern Christian. Their hopes, he said, will not end until they see the Middle East transformed through the values that Arab Christians cherish. "As Arab Christians, building our societies, loyal to our countries and nationalities, bringing hope in hopeless situations, and guarantees of developing civil society that respects human rights, freedom of religion, gender justice, and freedom of expression," said Younan. In 2010 Younan, who received his theological training in Finland, was voted as the first Palestinian to lead the Lutheran World Federation. Speaking for Middle East and Arab Christians he said, "Our hope will not end until we see the Middle East transformed into the values we cherish. "Our goal is not merely to survive, but to thrive." * Other speakers at the conference included Rev. Michel Jalkh, acting general secretary of the MECC; Rev. Katharine Jefferts Schori, presiding bishop of the Episcopal Church in the United States; Rev. Habib Badr, president of the National Evangelical Church of Beirut; and Patriarch Mor Ignatius Joseph Younan III, the MECC's president.